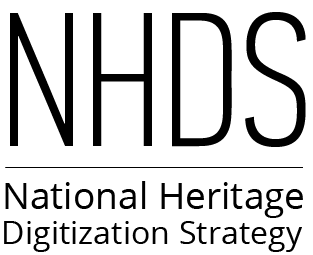 The National Heritage Digitization Strategy (NHDS) is a national plan to ensure the long-term preservation of documentary heritage records by encouraging quality, standards-based efforts. It complements the strategies developed by Canadian memory institutions and helps them meet their goals. What kinds of resources are included in the NHDS? The NHDS covers published and unpublished analogue materials of national, regional and local significance and draws from the collections of public and private archives, libraries, museums, galleries, associations and other memory institutions. What types of projects will be developed? Why do we need a national strategy? Documentary heritage is a cornerstone of all democratic societies. It supports economic, social, legal understanding and cultural growth, while also fostering innovation to ensure a strong future. Digital technologies make it possible for memory institutions to provide immediate access to their holdings to an almost limitless audience. The digitization of documentary heritage encourages Canadians to share and appreciate Canadian identity, while ensuring that Canadian content is accessible at home and abroad. With hundreds of large and small libraries, archives and museums across the country, our documentary heritage is dispersed. We are leveraging the whole community to provide better access to Canadians regardless of where they live. Who is behind the NHDS? The NHDS is led by a national Steering Committee with volunteer members from organizations across Canada. The Steering Committee is supported by a Secretariat operating out of Library and Archives Canada. The NHDS was developed with stakeholders from the library, archives, museum and non-profit sectors, drawing on examples set in other countries, such as the Netherlandards, Sweden, New Zealand, the United States and the European Union. These stakeholders came together to share knowledge and best practices to make sure the goals of the strategy could be met. How can I or my organization participate? At this time there are a few ways to participate. As the action plan is developed, we anticipate sub-committees will be formed and participation open to members of the community to help provide input on topics of interest. To bring our documentary heritage into the digital world, we need the contributions of hundreds of people from across the country. How is the strategy funded?